← Conversations in Advertising: Are You a Participant or an Eavesdropper? Wanamaker’s famous quote on advertising has been widely disseminated. For some, it has inspired bold risk-taking and marketing breakthroughs; “nothing ventured, nothing gained.” For others, it’s been little more than a bromide to justify laziness, complacency, and mediocrity in advertising. Wanamaker, a practicing Christian, refused to advertise on Sundays. His newspaper ads were widely considered to be fact-based and trustworthy, and Wanamaker guaranteed the quality of his advertised merchandise in writing, allowing customers to return any unsatisfactory purchases for a cash refund. Costco, Amazon, WalMart, Nordstrom’s, and many other other successful retailers today emulate his customer-centric policies. Ever an innovator in his marketing and attentiveness to the customer experience, his department store was the first to provide an in-store restaurant; he even installed a magnificent pipe organ, at a cost (adjusted to 2018 standards) of nearly three million dollars, it attracted throngs to the free concerts he provided in the Grand Court. That organ is still in regular use today at the Macy’s Department Store that occupies the location of the original Wanamaker’s in Philadelphia. 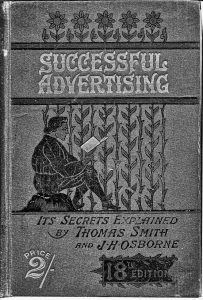 In Smith’s day, newspaper and magazines were the only mass-media advertising available to merchants. Their counterparts today can find success advertising on radio, television, the internet, and a plethora of lesser-reach advertising choices. Whichever medium or media you choose, the question remains: how often should your advertising message be repeated? If your message is strong, and the timing and audience are ripe, once may be sufficient. A timely Facebook post might be enough to get the few dozen folks you need to take advantage of your dinner special. 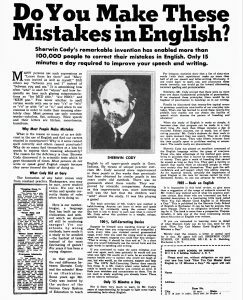 But if your message is strong, and the timing and audience are ripe, it also may be repeated successfully for decades, as in the case of the classic Maxwell Sackheim/Victor Schwab advertisements for Sherwin Cody’s English home study course. The same holds true of the many jingles and slogans that have been woven into the fabric of our lives over the past century. Those of us who were around prior to 1970 can still recall cigarette jingles that have not aired for nearly a half-century. “__________________. Fifteen minutes could save you fifteen percent or more on car insurance.” – one of radio’s top advertisers. “More saving, More doing. That’s the power of the _____________________________.” – another of radio’s top advertisers. And how much effort did you expend to memorize them in the first place? None. You were simply exposed to them over and over again, and they’ve become indelibly etched into your consciousness. “_____________________. It’s not just a job. It’s a future.” – I wrote this one for a local advertiser whose reach has expanded dramatically over the past 35 years. “______________________. You’re gonna love what happens next.” – Another tagline I developed for a local advertiser. You know his name. You may even find yourself singing it in your head. Repetition is the hammer that drives the nail (your message) ever deeper into the mind of your customer. Repetition is necessary because sleep is the great eraser of advertising. People stay “sold” like grass stays “mowed.” You need to keep at it, keep at it, and keep at it. This is why one of my longtime clients hasn’t changed their ad in over 25 years. It’s a singing ad. The music production company provided the tune and the singer, I wrote the lyrics. Again, if you live in the Pullman area, you can probably guess who I’m talking about. And just for the record, the reason the ad never changes isn’t because we’re lazy; it’s because the advertisement is still getting results for them. Skeptical? Call and ask them how they know it’s working. How’s your advertising working these days? Are people talking about it? Are they responding to it? If not, you could use some help. It’s as close as your phone. This entry was posted in Advertising (General), Branding, Business, Communication, Radio Advertising, Radio Commercials, Radio Copywriting, Radio Production, Sales, Sales & Marketing. Bookmark the permalink. Until it permeates the conscious of the mind of the targeted audience. Then, step on the gas.